As I said last year, The Story Prize doesn't choose its three finalists by critical consensus, and we probably read more short story collections than most of the booksellers, bloggers, or reviewers who put out yearend lists do, so we're choosing from a different and larger pool. We'll be announcing our finalists in the next ten days or so, and shortly after that our notable books. I can tell you right now that some of the 21 books on this list won't be among our finalists or on our list of other notable books. And it's also possible that we will honor collections that none of the 26 sources below named. There were a lot of excellent collections in 2009, and we hope to also shine the spotlight on some that haven't gotten enough attention. Sources: About.com (Tower), Amazon.com (Tower, Meloy, Hemon, Boswell, Holt, Gaitskill), Atlantic (Lasdun), Barnes & Nobel (Tower), Chicago Tribune – Printer’s Row (Campbell, Mueenuddin), Christian Sceince Monitor (Adichie), Cleveland Plain Dealer (Campbell), Entertainment Weekly Shelf Life (Mueenduddin), Idlewild Books (Mueenuddin), Kansas City Star (Campbell, Hemon, Jin, Mueenuddin, Peele, Tower), Largehearted Boy (Lasdun, Miller, Millett, Peele, Thompson, Towers), L.A. Times (Adichie, Lasdun, Meloy, Millet, Yoon), Louisville Courier-Journal (van den Berg), Miami Herald (Thomspon), The New Republic (Adichie, Tower), New York Magazine (Tower), New York Times (Gaitskill, Hemon, Ishigiro, McInerny, Meloy, Mueenuddin, Nelson, Thompson, Tower, Yoon), NPR (Gappah, McCorkle, Mueenuddin (2), Yoon), Philadelphia Inquirer (Jin), Providence Journal (Millet), Publishers Weekly (Mueenuddin), San Francisco Chronicle (Adichie, Gaitskill, Hemon, Macy, Mueenuddin, Nelson, Tower, Yoon), Slate (Tower), St. Louis Post Dispatch (McInerny), Time (Mueenuddin, Tower), Village Voice (Tower). I think Gary Vaynerchuk is great. I love his store—Wine Library—and I admire his energy. His book Crush It sounds truly inspiring. But I don't think his can-doism is the key to success in all areas. And he comes off sounding glib and a bit naive when he shows GalleyCat how to apply his methods to succeeding as a short story writer. It takes more than time, energy, and social networking to succeed as a short story writer. Vaynerchuk throws out the phrase "creating great content" as if it's purely a matter of will. But talent is something you can't will into existence. And developing talent takes time, patience, a capacity to improve, a certain kind of stubbornness, and a particular sensibility that isn't necessarily compatible with haunting chat rooms and leaving comments on blogs. Would Gary V. say that someone could succeed as a football player by blogging and twittering? I don't think so. You might find a game to get into, but that doesn't make you a pro. I admit it. Last year, I was somewhat obsessed with the yearend best books lists, keeping track of and tallying the short story collections mentioned by newspapers, magazines, booksellers, blogs, and Web sites as they came to my attention. Short story collections have done so well, on so many levels, in 2009 that I don't feel quite so compelled to trumpet these mentions. I expect short story collections to be well represented on these lists, given the quality and breadth of collections we've read so far this year. Newspapers and magazines only choose from among the books they review. And as far as short story collections go, they don't necessarily review very many of them. Certain books get more attention than others, and those books tend to make the lists. So a tally of short story collections (and all books) on yearend lists is as much a tally of buzz as of excellence. Good books get overlooked. For instance, I didn't see one of last year's finalists, Joe Meno's Demons in the Spring, on any 2008 list. Also, books published early in the year can be forgotten. I haven't seen any mention of Louise Erdrich's collected stories, The Red Convertible, which came out in January. It's a matter of taste. This may seem obvious, but some people give a lot of weight to the selections of, say, The New York Times. If you're a discerning reader, you're in as good a position to judge as any reviewer. Of course the lists that matter most to me are the books we choose as finalists for The Story Prize in early January and the list of other notable books we cite (which we post shortly after we announce our finalists). We will have chosen those books out of 78 entered for The Story Prize, which is probably about two-thirds to three-quarters of the short story collections published in the U.S. in 2009. To a certain extent, that addresses points 1 and 2 above. But points 3 and 4 are still in play--any such choices come down to personal preference, and good books are often overlooked in any process. 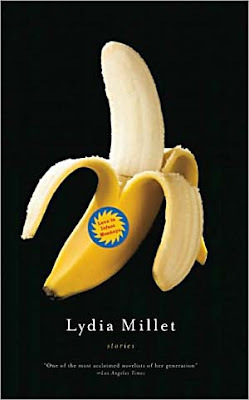 Another short story collection this year that has a design that caught my eye is Lydia Millet's Love in Infant Monkeys, published by Softskull Press, which Laura Miller of Salon just named as one of her Best of 2009 fiction picks. The image of the half-peeled banana against a black background is striking. But the most original detail is what's on the peel—an actual sticker with the book's title printed on it. Aside from the effort it must have taken to apply a sticker to each copy, I can't imagine a commercial publisher would allow a title to be that small on the front cover. "I'd had the sticker on a banana idea for a while but never managed to get it through. After thinking about the monkeys in the title, I instantly thought of the banana idea. Softskull had no problem with the title being so small. In fact, when I sent them the comps for this, they were just about to publish a book called Rebels With Attitude, which has a banana on the cover and no type at all, so they probably thought I was playing it safe." "The second Jamie suggested the sticker I loved it. I got our production manager to price it immediately in the hope I'd be able to make it happen, and it was pretty cheap!" "I can't take credit either for the cover and its boldness or the interior illustrations, but I will say the cover is one of my favorites among my own books and the drawings inside have a heartbreaking quality for me. I walk around showing them to others proudly. "It was Maria Massie, my agent, who thought of asking Jamie Keenan to do the cover and Richard Nash who actually asked him — and curiously, no one at Counterpoint ever quibbled (at least, with me) over the minuscule title print. And I didn't mind it at all in this case — the title incidentally is not my own, that is, it was Harry Harlow's title, the title of a famous paper he wrote on taking baby monkeys away from their mothers, his so-called maternal deprivation experiments. "I will say this: If you look closely, you'll see the cover's banana is broken. We originally had an intact banana. Then that particular image turned out to be excessively costly. So I was asked, We can get this other, slightly broken banana for hundreds of dollars cheaper. Is that a problem? I said no. I welcomed the broken banana. "But I like the symbolism. These days, apparently, you can't even buy an unbroken banana without breaking the bank." By the way, Keenan also designed the cover of Joe Meno's The Great Perhaps. He's another Massie client and, of course, a 2008 Story Prize finalist. The results are in. 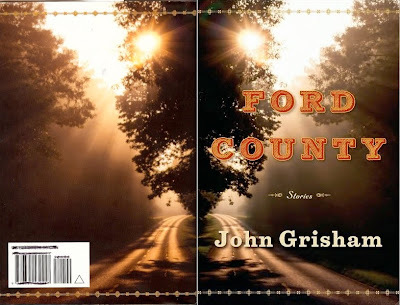 The unadorned back cover I previously posted belongs to none other than John Grisham's Ford County. Blogger Kathleen Gerard was the first to correctly identify the title of the book and will be getting a copy, courtesy of The Story Prize. Thanks to all who sent their guesses. What struck me about this particular back cover was the absence of review quotes, blurbs, an author photo, or a description of the book. Indeed, all the collection really needs to sell it is two of the words on the front cover: John and (especially) Grisham, a brand so powerful it speaks for itself. Needless to say, out of the 78 entries we received for The Story Prize, this was the only one that had such a clean back cover. And the book, despite being a collection of short stories and not a novel, jumped right to the top of many best-seller lists (the fifth best-selling story collection this year, joining those by Uwem Akpan, Stephen King, Jhumpa Lahiri, and Elizabeth Strout). Ford County is crafty and fun to read, and Grisham is a very skillful storyteller. I confess, I've seen movies based on his books but never before so much as picked one up. Some might call it snobbery, but I think it's more a matter of demographics. People with my background and interests, for the most part, generally don't read Grisham. And the books I generally read are unlikely to find their way into the hands of most of Grisham's readers. Of course there's an overlap, but I doubt it's very large because the audience for literary fiction isn't very large to begin with. 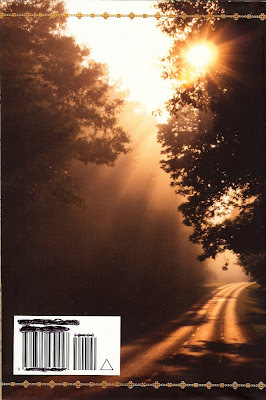 In any event, I'd encourage more readers to cross those lines both ways—Grisham readers who haven't done so before might also enjoy reading stories by Alice Munro, William Trevor, and many others. The short story has become a genre form in many respects, but its roots (as everyone knows) are as a form of entertainment. Before radio and television, short stories appeared in newspapers and many more magazines than today, pitched to the public at large. For the short story to thrive and grow, readers and writers must avoid embracing marginality. I love well-executed stories that value language above all else, those that are character-centric, those that are multi-layered, and those that are cleverly conceptual. But let's not forget the value of plot. Readers and students of short fiction could learn a lot about storytelling from reading the stories in John Grisham's Ford County. The back cover of this book is rather striking. Why? Because, aside from the UPC code, there's nothing on it. It's a recently published short story collection. Any guesses as to the title and author? The first to send an answer to info@thestoryprize.org, and explain how he or she knew, wins a copy. (And no trying to read the ISBN number, please).